The Normandy landing forces began loading onto the invasion ships. The Mighty 8th would need to start concentrating on the Atlantic Wall, but they still needed to keep applying pressure on the Luftwaffe to get them to stay in Germany. To accomplish both goals, they divided their forces. 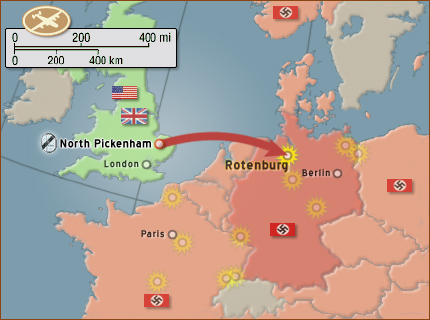 The 2nd Air Division would continue its deep raids into Germany. The 492nd was assigned to destroy an air depot in Rotenburg, Germany. The Group dispatched 29 of its planes under the command of Captain Hurley flying with the Val Preda Crew 601. Two of the Liberators had to abort, most likely for mechanical reasons. After being out-guessed by the Luftwaffe on the previous mission, the fighter protection was more evenly assigned to cover the armadas. But on this day, the 1st Air Division could had used the extra protection it got the day before. The Luftwaffe paid little notice to the two B-24 forces attacking Germany, but concentrated on the B-17 force instead. Therefore, aside from the usual flak, the well escorted 492nd had a breezy day. Despite the mission's number, there was nothing unlucky about 13. This mission was so easy that very little was written about it. It fact, the Group's monthly summary report barely mentions it all. It did sat that one of the 27 credited sorties wasn't able to drop its bombs on the target. By now, one thing about this Group stands out. They were battle-hardened veterans. When they took off on this mission they had no idea of what kind of day they would have. They only knew that they were going to Germany where anything could happen. But they left knowing that they had a job to do and that they would deal with whatever resistance whenever it was encountered. Even Lt O'Sullivan and his crew had no reservations about going back into Germany. They had a hard day there just the day before and were given up for lost, but went back at it again. It's doubtful that anyone in the 492nd knew that this would be the Group's last mission into Germany for a few weeks. The countdown to D-Day had begun, and weather permitting, the near future missions would be to support the ground troops. The deep daylight missions into Germany did pay off for the Allies and the Normandy invasion. It kept the Luftwaffe locked up inside Germany, thus giving the Allies total air supremacy over Normandy. And without the hard-earned air and sea dominance enjoyed by the Allies, the Normandy invasion couldn't have succeeded. The 37 Allied divisions would never be able to land against the 60 German divisions waiting for them.